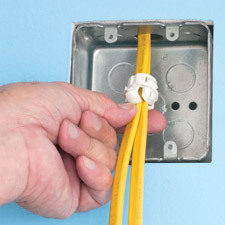 UL/CSA Listed, Arlington’s economical White Button™ non-metallic cable connectors offer easy insertion of one or two cables into a single opening from INSIDE or Outside an electrical box. They’re the lowest cost NM cable connectors on the market, with fast, push in installation! NM94X for 1/2” KO and NM95X for 3/4” cost the same as Arlington’s popular NM94, NM95 connectors.